Paella catering for corporate party’s has proved to be a big “YES” for the staff and guests for that special business event. Your Paella will help impress your corporate clients by cooking delicious Paella on site with their famous “Paella Cart” helping you and your business stand out from the crowd. 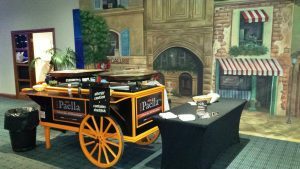 The “Paella Cart” has been custom made for a whole new look to corporate catering. The “Paella Cart” is able to cook 120 portions of delicious Paella and then keep on cooking 60 portions at a time, time after time so if you need to feed hundreds of clients and guests Your Paella and their famous Paella cart is all that you would need to provide a real WOW! factor to your corporate party or event. If you’re looking to serve 300 corporate guests in one sitting that’s no problem. More large Paella pans can be added if you need an instant service rather than a staggered service. 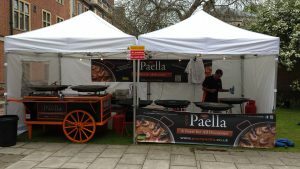 Your Paella have years of experience when it comes to cooking fantastic tasting Paella’s and being a small business they know how important first impressions are. 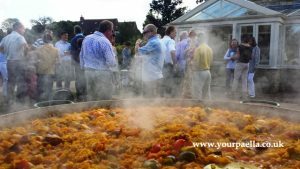 If you are looking for a corporate catering service with a difference, then why not give Your Paella a go, you won’t regret it! Check out some of their past clients reviews on Yell.com, just click here. 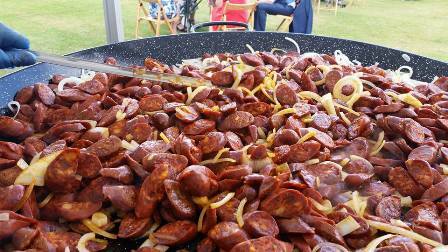 https://www.yourpaella.co.uk/wp-content/uploads/2017/04/Chorizo_in_red_wine.jpg 252 448 Gary Evans https://www.yourpaella.co.uk/wp-content/uploads/2019/01/logotrans1-300x106-300x106.png Gary Evans2014-09-08 18:55:482017-06-11 22:27:21Corporate Paella Party. Spanish Tapas for your wedding or party. Christmas Catering Paella Party.